Ledermix* - demeclocycline hydrochloride and triamcinolone acetonide. POM. Please note that this information is intended for Dental Professionals only. Please see resources section at the bottom of this page for prescribing information. When pulpal pain and inflammation threatens, look to Ledermix* – demeclocycline hydrochloride and triamcinolone acetonide. Ledermix dental cement powder combined with Ledermix liquid hardener is a hard setting permanent material. Ledermix combines the antibiotic action of demeclocycline with the anti-inflammatory action of triamcinolone acetonide. 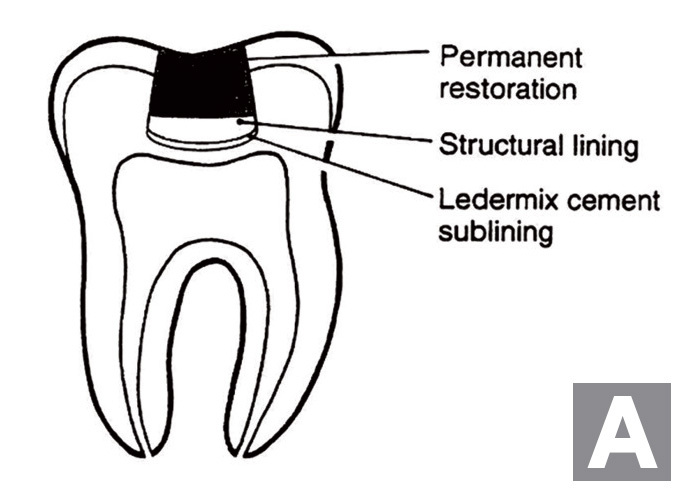 Ledermix cement can be used as a dressing or lining under temporary or definitive restorations in teeth with reversible pulpitis with or without pulp exposures. Ledermix Cement may be used as a sublining for deep cavities where no exposure has occurred, particularly if the dentine is hypersensitive (a). 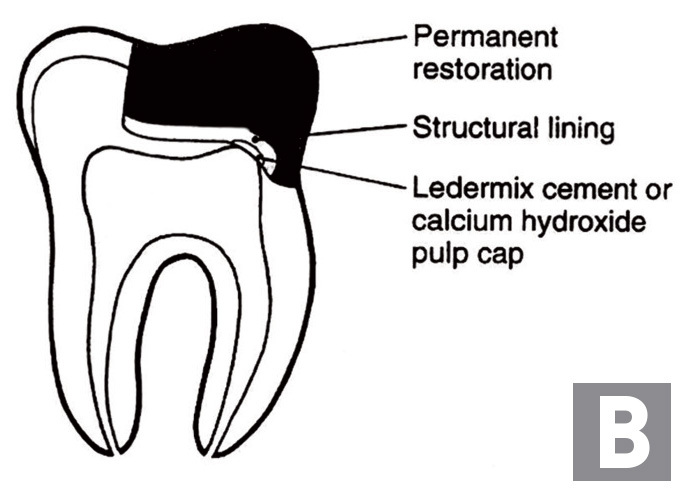 For small pulp exposures, Ledermix dental cement may be used as a pulp capping agent (b). In both cases the pulp vitality should be monitored regularly with an electric pulp tester or ethyl chloride. If the pulp is non-vital, endodontic therapy will be required. Setting time is influenced by ambient temperature and humidity. Blend a small amount of the liquid into the powder using a spatula until a thin homogenous cream is obtained (this takes about 10-15 seconds). Take up the resultant mix onto a spatula blade, then apply to the site using an amalgam plugger or blunt probe. Ledermix Paste is particularly useful in the emergency management of patients with irreversible pulpitis. Pain is reliably relieved until definitive root canal treatment an be performed. Ledermix Paste contains one third more steroid than Ledermix cement. Consequently the paste is usually preferred for use in pulp exposure cases. 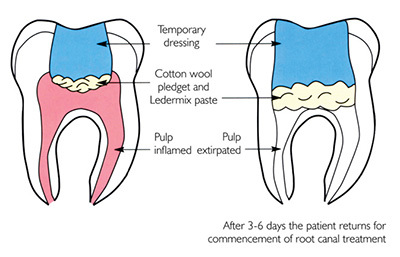 After pulp extirpation and during endodontic therapy, the canals may be filled with Ledermix Paste. The cavity is closed with a cotton wool pledget and a temporary dressing. 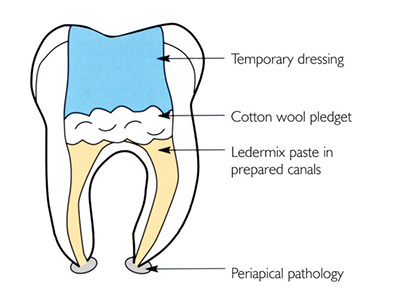 Ledermix Paste is water soluble and can easily be rinsed out of root canals. 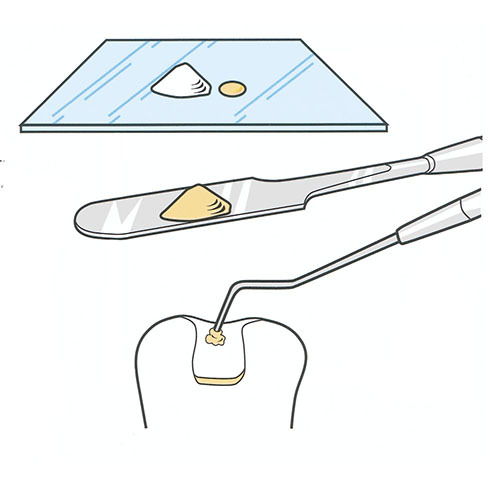 When canal preparation has been completed, obturation is then performed using the dentist’s preferred material. N.B. There is no dropper supplied with the Hardener bottle, collect liquid with the mixing spatula and tap on to mixing pad. Alternatively Ledermix Droppers are available on request from your dental supplier. Contact us on sales@owwarehouse.co.uk for further details. Ledermix is currently un-licenced in the Republic of Ireland.